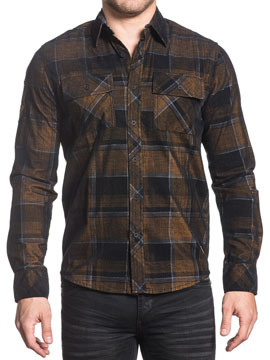 Affliction Copper Mountain mens long sleeve button up woven plaid shirt features two chest pockets on the front. Small Affliction logo embroidered patch sewn on one sleeve. 100% Cotton. Slim Fit, Custom Buttons. Machine Wash Cold. Color: copper brown and black plaid.